Put the wiper arms in the service position. Turn the ignition switch ON and then OFF. Within 1 minute, activate washer switch 2 times in less than 0.5 seconds to put the wiper arms in the service position. Lift the wiper arm away from the windshield glass. Rotate the wiper blade and push the release tab (A), then move the wiper blade down (B) the wiper arm. Return the wiper arm to the service position on the windshield to prevent damage when the hood is opened. Insert the wiper blade onto the wiper arm and slide it up until it clicks into place. Lay the wiper arm back down in the service position on the windshield. Turn the ignition ON and operate the windshield wipers to ensure the repair has been completed properly. Operating the windshield wipers will cancel service mode. Check that the wiper blade contacts the windshield properly; otherwise the wiper arm may be damaged from wind pressure while driving. Remove the wiper blade. Refer to WW-58, "WIPER BLADE : Removal and Installation". Hold the wiper blade refill lip at the end (A) of the wiper blade (1) with a suitable tool (B) as shown and pull it firmly in the direction (C). If the wiper blade refill lip is torn due to wear, insert a suitable tool (A) into the space between the end of the wiper blade refill (1) and the wiper blade (2) and pull the wiper blade refill (1) out as shown. If the rib (A) has become detached from the wiper blade refill (1), check that the curve of the rib (A) is in the same direction as the curve of the wiper blade refill (1) and insert the rib (A) into the slit (B) in the wiper blade refill (1) as shown. 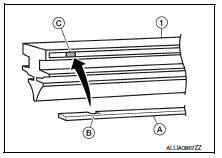 If the rib (A) has a notch (B), insert the rib (A) into the wiper blade refill (1) so the notch (B) fits over the protrusion (C) in the wiper blade refill (1) as shown. Insert the wiper blade refill (1) tip into the end of the wiper blade (2) in the direction (C). 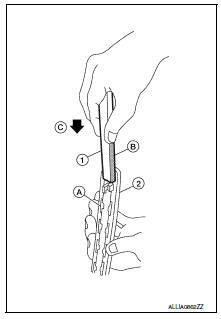 Push the wiper blade refill (1) in while pressing it into the end of the wiper blade (2) as shown. After the wiper blade refill is fully inserted, remove the holder (B). Make sure to slide the refill into the wiper blade so that the wiper blade refill is held by the tabs (A) on the wiper blade as shown. Push the wiper blade refill (1) until the tabs on the wiper blade (2) fit into the stoppers (A) in the end of the wiper blade refill (1). Make sure the LOCK mark (B) on the wiper blade refill (1) is aligned with the lock point symbol (C) on the wiper blade (2) as shown. 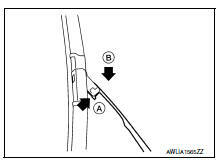 Before installing the wiper blade, make sure that the wiper blade refill (1) end is fully covered by the wiper blade (2) in area (A) as shown. Install the wiper blade. Refer to WW-58, "WIPER BLADE : Removal and Installation".